Forget shining armor. Motorcycle shop owner Mary Jane Parker could use a knight in black leather right about now. A local gang has been extorting her for protection money, and standing her ground would be a lot easier with the Brothers of Mayhem at her back. She just needs to convince the club’s new president to take the job. 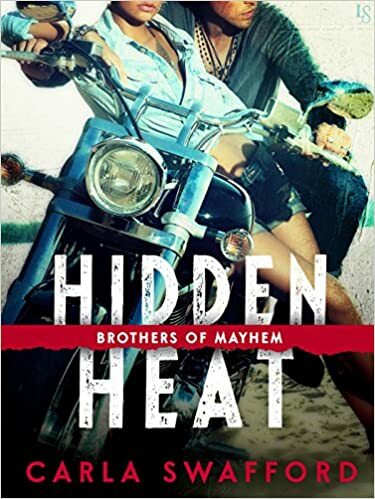 The powerful, brooding biker claims he’s not interested-but if his version of tough love is supposed to be punishment, Mary Jane would gladly misbehave for the rest of her life. Storm Ryder has no interest in rescuing anyone but himself. He spent three agonizing years in prison, and there’s no way in hell he’s going back, not over a spoiled rich girl who’s flirting with trouble. So why does he find himself craving Mary Jane’s lips-and holding her close when he should be pushing her away? Deep down in his tortured soul, Storm knows she’ll be there for him. And when Mary Jane needs him most, he’ll find the courage to give her everything he’s got. He kinda makes you think of this photo. Author Meda White and myself are having an Angel and Demon Party with lots of giveaways. Come by and say you’ll be there on February 16, 2016. That’s the day HIDDEN HEAT will be released. YAY! We will be giving away gift cards, books, and swag. A few of these for example. The red oval is a jar opener/coaster. I’m sure you can guess what the other two items are. HA! Staring Feb. 8 on Goodreads is Romance Week. Be sure to stop by my profile and ask me questions. By the way, here’s my choice for most romantic quote. I will be signing at several places this year. If you’ve been following me on Facebook, you know that I love hockey. If you’re in Nashville on February 20, I’ll be at the Predators’ game against LA Kings. Let me know if you’ll be there, and I’ll meet up with you and give you some swag. Hope to see you there. Whew! That’s it for now. Time for me to get back to working on NAKED HEAT (after the game tonight). That’s Wolf’s story. He’s kidnapped the love of his life, and he’s in deep do-do. LOL! Thank you, Beverly!!! Appreciated very much!